Imation LTO 6 tape cartridges continue the incredible capacity growth of the LTO line, which has increased cartridge capacity by a factor of 30 since the launch of LTO 1 in 2001. LTO 6 also extends the rapidly increasing transfer rates of LTO technology, which have increased by a factor of 13-enabling an LTO 6 drive to write the equivalent of an LTO 1 cartridge every 11 minutes ONLY WHILE STOCKS LAST! Imation® LTO 6 tape cartridges continue the incredible capacity growth of the LTO® line, which has increased cartridge capacity by a factor of 30 since the launch of LTO 1 in 2001. LTO 6 also extends the rapidly increasing transfer rates of LTO technology, which have increased by a factor of 13-enabling an LTO 6 drive to write the equivalent of an LTO 1 cartridge every 11 minutes. Featuring 2.5TB of native storage (6.25TB of compressed storage) and data transfer rates of up to 400MB/second, Imation Ultrium LTO 6 tape cartridges deliver powerful improvements over prior generations. 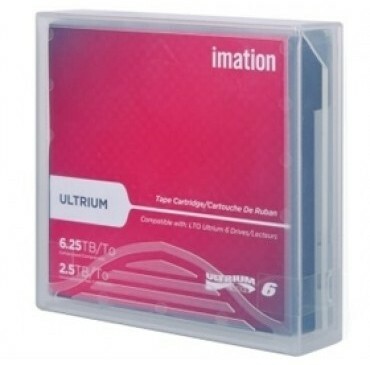 Imation Ultrium LTO 6 tape cartridges also include a partitioning functionality that enables the use of the Linear Tape File System (LTFS). LTFS provides familiar drag-and-drop capability and lets users easily see what information is stored on the tape. This feature also enables nearline applications to index data and allows for faster searches via enhanced file control and space management. Purpose-built for long service intervals (30 years estimated archival life) and heavy-duty use (20,000 load/unload cycles), Imation LTO 6 tape cartridges include a limited lifetime warranty.